"What I have seen, what I have done, it has changed me. I am the place where two rivers meet, silted with upheaval and loss." Willa Obenchain was abducted by Mohawk Indians at 14 and lived with them for many years before returning to her family farm. When she arrives home, she finds a wounded Scotsman on the border of her family farm who she takes under her wing. Left with a place fallen into disrepair and an unknown future, Willa struggles to find her place in a world much changed. Beautifully written, this novel is bound to especially thrill fans of classics like Caddie Woodlawn. 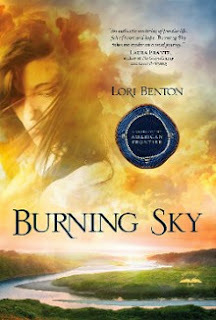 Lori Benton is a wonderful addition to Christian fiction. I look forward to reading her next novel! When her best friend mysteriously dies, Bethany Barclay winds up in the middle of a secret war between good and evil. Running from the law after an ex-boyfriend is murdered in her home, Bethany little realizes that she is a pawn between several different forces, all looking for a historical artifact that could strengthen the message of Christianity by proving that Jesus Christ was the Savior He claimed to be. Filled with interesting characters and non-stop action, I couldn't put this book down! 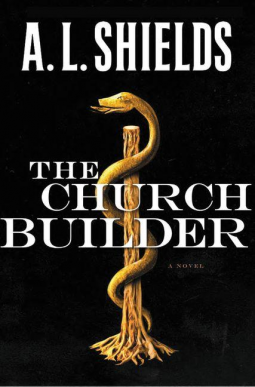 The story drew me in from the first, leaving me looking forward to more novels by A.L. Shields (which is a pseudonym for New York Times best-selling author Stephen L. Carter). The second book in the Culper Spy Ring series finds Winter and her family again involved in collecting information during a time of war in America. Great Britain has again declared war on the colonies in 1812, seeking to bring the young country under their thumb. When young Gwyneth Fairchild witnesses her father murdered by someone she trusts, she takes flight to America, in hopes that the Lanes will protect her from the turmoil surrounding. Left with no one else to trust, she must rely on complete strangers to help her recover from the shock of a world turned upside down. 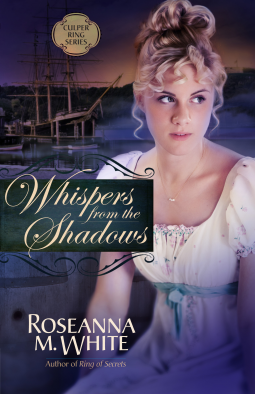 While I didn't connect with the characters from this novel as I did with those in Ring of Secrets, I still found Whispers from the Shadows to be a great continuation of the story. I look forward to the third book! There is more to Winter Reeves than meets the eye. Forced to project herself as a silly aristocrat by her demanding grandparents, she find that the front is the perfect way for her to gather information for the Patriot's in the Loyalist dominated city of New York during the Revolutionary War. When Bennet Lane meets her, he realizes there is more to Winter than just a pretty face, and seeks to go about discovering the heart behind the mask. But, Bennet is on his own mission in New York City: one to uncover the infamous Culper spy ring. 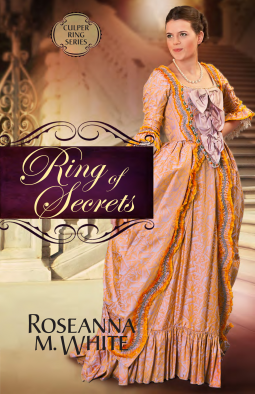 Filled with dazzling details, interesting characters, and a riveting plot, Ring of Secrets is bound to delight readers for years to come! And the good news about it? This is the first in a series by Roseanna White, so there is at least two more books in the series, set during other American wars. Lilly Corbett Still felt God calling her to practice medicine in the small Kentucky mining town, Skip Rock, though it isn't always easy to be a female doctor in the early 1900's. With her husband on the road a lot, she keeps busy with her practice and keeping tabs on her visiting sister, Mazy. When her good friend and neighbor, Armina, is found sick and suffering from memory lost, with an unfamiliar baby in tow, Lilly and Mazy attempt to piece together what happened. Could Armina have stolen the child? Or, will the baby bring danger to their small community? Set in the hills of Kentucky, Tattler's Branch gives readers a chance to go back and time to a place very different from modern day. I found this book interesting, it kind of reminds me a bit of Christy, since it shows how difficult it was for a young woman to make her way in a world dominated by men. I did find it kind of weird that most of the main male characters from previous books in the series are, for the most part, not really present in this novel. I didn't like that the story was trying to justify one of the characters leaving her husband (if she chose) because he was a "good for nothing". With it being a Christian book, I would think they should of encouraged her to work things out. Thankfully, that part of the story was resolved. Fans of Jan Watson should be delighted with this new addition to Lilly's story! Still. Was this character based on anyone in particular? lives, I would choose Lilly’s. She is so strong and determined. In the stunning finale to the Angel Eyes trilogy, Brielle and Jake find themselves in a hard place. Brielle has been left behind after a battle where Jake was taken by the demon, Damien. As she seeks to do all she can to help the angels around her fight to keep demons at bay in her small town and keep the veil from tearing, she can't help but think that life would be more peaceful without her celestial eyes. When she falls into a trap while trying to rescue Jake, she is given the chance to no longer have to see beyond the Terrestrial. Will Brielle make the right choice, even if it could cost her the love of her life? The whole trilogy was excellent, but I think I like Dark Halo the best, since the novel tied everything together. I felt like the first book did well enough standing alone, but the second one left a lot hanging that was resolved through this one. I like that this series is about spiritual warfare and that it gives you a lot to think about. Excellent! After making it as one of the first female partners in a 1982 New Orleans law firm, Rebecca Jacobs feels like she has it all. A loving husband and a job that she adores. 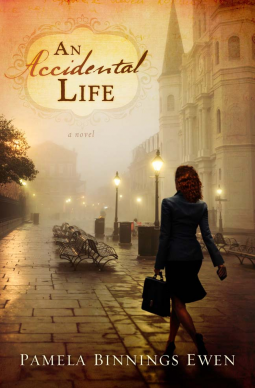 When she discovers they are expecting their first child, things turn upside down as she figures out how to make it as a career woman and a mother. While Rebecca struggles to figure out how to mesh two worlds, her husband is fighting a battle in the courtrooms to expose what happens in the case of live birth abortions, with the hope that he can help those who are born alive after an attempt to be aborted. I thought this book was amazingly well writing and incredibly informative about something that should be better broadcasted. Who thought to ask what happens when a baby is born alive after the mother has made the choice to terminate it's life? I figured it was a no brainer, no matter what side of the issue of abortion you stand on. When a baby is born alive, it should be given every chance to survive, not left to die in a utility room. It's tragic and really goes to show how we, as a society, fail to value human life. It's sad that there we have the Born Alive Infant Protection Act of 2001 that was set up to come to the infants aid, and yet it is only a federal based law and is not binding for state run hospitals and private clinics. The matter of live birth abortions is still very much an issue today as it was in 1982, or 2001. 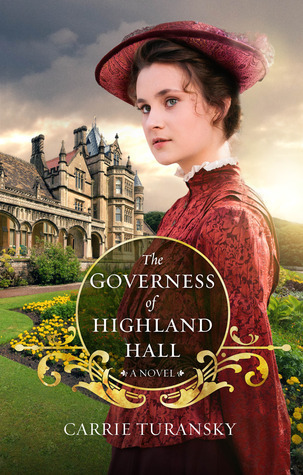 After spending the last 12 years in India with her missionary parents, serving as a governess on a wealthy estate could not be a more different life for Julia Foster. And yet, Julia finds that perhaps she can still guide hearts to God even though she isn't technically in the mission field. When her father's illness takes a turn for the worse, Julia and her parents are forced to leave their mission post behind in the hopes of returning once her father is cared for and returns to full health. Taking on a governess job to help pay the bills, Julia is soon drawn into the lives of her four charges and that of the staff around her. As she draws closer to her four pupils, she finds herself falling for the master of the hall. Even though Sir William Ramsey finds himself drawn to the spirited young woman, he is pressed to come up with money to fund the repairs on the estate he has recently inherited from a cousin. Seeing marriage to a woman with a large dowry seems the only way he can afford to make the repairs. Will love win over duty? I found this book to be well written, not to mention engrossing. It sweeps one into the story and time period, as well as the lives of Julia and the others who live in the manor. I especially liked that the story was told from several different view points and that it has strong secondary characters. Tandi Jo Reese is looking for a fresh start in the small community of Hatteras Island after suffering from a messy relationship that left her small family emotionally bankrupt. Just when things are looking the most bleak, the opportunity to clean out an old Victorian house that belonged to a 91 year old recluse saves her and her two kids from total financial ruin. While cleaning Iola Anne Poole's house, Tandi comes across a mysterious series of boxes with notes going back as far as the early 1930's that are filled with Iola Anne's prayers and thoughts. As Tandi becomes more engrossed in the story of a woman who had seen so much, she starts to really look at her own life. This story is incredible! I've read several of Lisa Wingate's novels over the years, but have to say that she outdid herself this time. The story is so beautifully written! Both realistic about struggles we all go through and yet filled with a wonderful message of hope. I can't recommend this book enough! It is one of my new favorites.